Rodriguez, 40, has spent the last 14 months training for marathons, distance running and connecting with fellow runners. He is a regular at the 2nd Street trail in McAllen and completes 14-mile runs as often as he can. He participated in the McAllen Marathon Scott Crane Memorial Run last year and considers it one of the most special events he’s participated in. “It was great to see the community recognize one of our city’s leaders by naming the run after him,” he said. 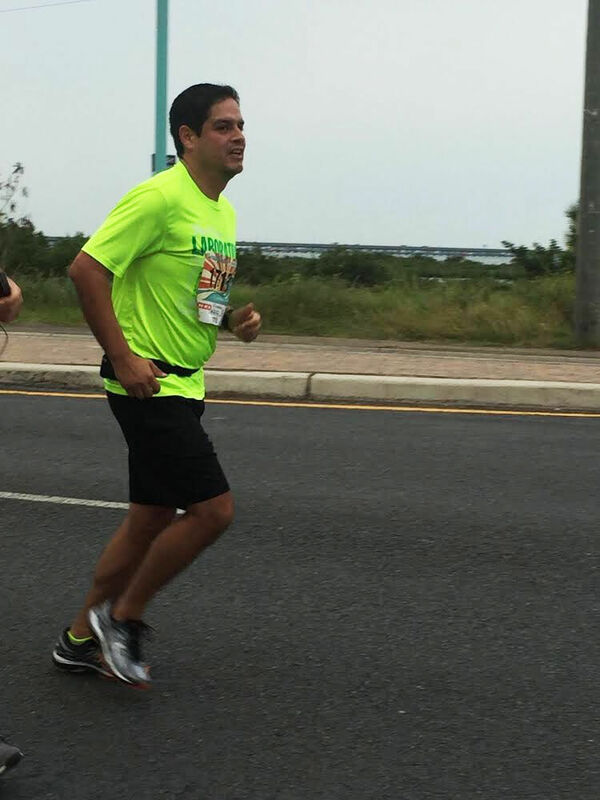 Rodriguez plans on attending the McAllen Marathon again this year with his family. ANSWER: It depends on the race. I’ll run 5K’s any time of the year because the distance is not too much to handle. When it comes to half-marathons, I consider the time of year and what the weather should be like. The number of participants is also important to me because I’m a competitor and want to see how I rank amongst the participants. Q: Do you run marathons to support any causes? A: I don’t have a specific cause at this moment. I’ve been considering running for charity and taking pledges for each mile I run, but I’m not entirely certain how to go about that yet. If anyone reading this does, I’d love some feedback. For now, I run because I can. Tomorrow isn’t promised and as long as I can still keep going, that’s exactly what I plan to do. There are many among us who wish they could run but can’t due to different reasons and it’s something that’s taken for granted. I don’t want to take this simple gift for granted. A: My wife is very supportive. I talked to her about qualifying for the Boston Marathon by 2022 or sooner and she is on board 100 percent. My son and daughter love receiving the finisher medals to the races I compete in. My son gets the medal and my baby girl gets the bib. A: The one thing I’ve learned is to remain consistent when attempting to reach my goals. I’ve fallen flat on my face, figuratively, when I don’t prepare well. Consistency, no matter how you feel on any given day, is key. Also, be sure to plan rest days into your running schedule. Listen to your body. It will let you know when you need to pull back a bit. A: Aside from a friend inviting me to run with him, I also knew I needed to make some lifestyle changes if I wanted to be around to see my kids grow up. I had received some less than stellar results from some lab work I had recently done. I knew I had to be healthier. Running has afforded me that. Running has also been an outlet for me. A stress reliever. I use my time while I run to clear my mind. Running has also awakened a part of me I lost a long time ago. The competitive side of me. The driven side of me. The drive and determination to complete everything from training, to any given race, transcends to every facet of my life. I call it relentless forward progress. There’s a famous line in regards to long distance racing that says, “Run when you can, walk when you have to, crawl if you must, just never give up.” That’s how I lead my life and meet the challenges in it.